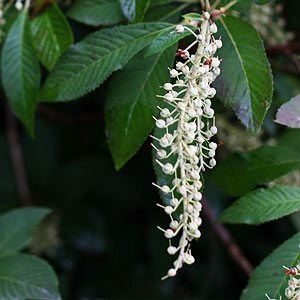 Clethra are a group of both evergreen and deciduous to semi deciduous shrubs from China and also North America. Summer flowering they do prefer a humus rich moist but well drained soil. Flowers appear as long terminal panicles and usually droop gracefully although some species hold the flowers more upright. With good glossy foliage and a dense habit, Clethera can also be used a screening plant or informal hedge. With white bell shaped flowers Clethra arborea is commonly called the ‘lily of the valley tree’. Glossy green foliage this is a small growing evergreen tree to around 7m in height. Deep green heavily ribbed foliage, the flowers are perfumed and a number of cultivars are available. C. alnifolia ‘Ruby Spice’ with very attractive pink flowers is a standout. C. alnifolia ‘Hummingbird’ is a low growing cultivar to around 1m, fragrant white flowers and in a smaller growing plant versatile in landscaping uses. Aslo known as ‘Summer sweet’ this species is from China, best grown in part shade it will reach around 4m in height with white flowers in summer.